Indian Army is all set to induct 300 of Prospina (earlier known as Nag, in Hindi for "Cobra") ATGM, a third-generation, fire-and-forget, anti-tank guided missile system. It is one of five missile systems developed by the Defence Research and Development Organisation (DRDO) under the Integrated Guided Missile Development Program (IGMDP), which also involved the development of four other missiles that are Agni, Akash, Trishul, and Prithvi. "A high-level meeting of the defence ministry will consider a proposal to acquire 300 Prospina (Nag) missiles and around 25 Nag Missile Carriers (NAMICA) worth around Rs 500 crore for induction into the Indian Army in the next few days," government sources told to a local Indian newspaper. In February 2018, 190 mm Prospina (Nag) was successfully tested in desert conditions (at Pokhran Testing Range in Jaisalmer district) against two tank targets at different ranges and timings, paving the way for its induction into the Army. 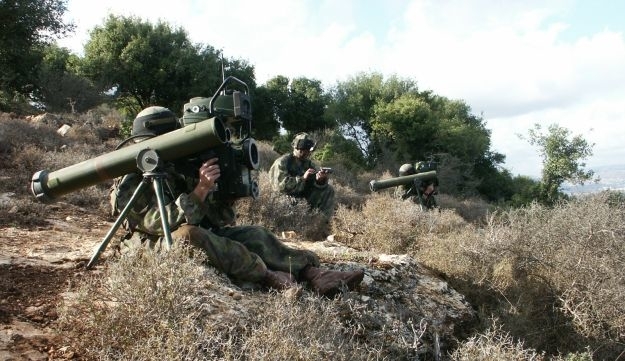 There is a speculation, the last test has jeopardized a potential deal to purchase Spike anti-tank guided missiles (ATGMs) from Rafael of Israel worth US$500 million. India had expressed interest in buying Spike missiles through the government-to-government (G-to-G) route in 2017, but in early 2018 it decided to cancel a deal to procure the weapons after the DRDO expressed confidence of producing the indigenous Nag ATGM. The missile system has been undergoing series of trials (in quick succession) since last two years at various test ranges in the state of Rajasthan. In recently concluded DefExpo 2018, Dr. S. Christopher, Chairman, DRDO, in a press conference held by DRDO at the venue in Chennai had said - "The remaining trials of this missile will be finalized until the end of 2018 and production will start next year onwards." 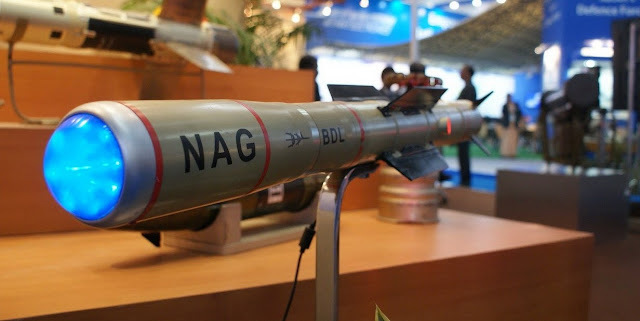 The Prospina (Nag) ATGM is equipped with an indigenous high-resolution imaging infrared seeker developed by Bharat Dynamics Limited (BDL), capable of operating during day and night, which provides passive homing guidance for engaging static/moving tank targets. It has a flight speed of 230 meters per second and is armed with an 8kg tandem shaped-charge warhead. It has a rocket motor using a nitramine-based smokeless extruded double base sustainer propellant, has a single-shot hit probability of 0.77 and a CEP of 0.9 meters, and has a 10-year maintenance-free shelf-life. The missile is equipped with four foldable wings and has a length of 1.85m, a diameter of 0.20m, a wingspan of 0.4m and weight of 43kg. The missile will be based on NAMICA (Nag Missile Carrier), which is an improved version of the Soviet-designed BMP-2 infantry fighting vehicle (IFV), licensed manufactured in India as "Sarath". The carrier weights 14.5 tonnes in full combat load and is capable of moving 7 km/h in water. It is equipped with nuclear, biological and chemical (NBC) protection, independent gunner and commander sights, silent watch capability, and a fire suppression system for crew safety and comfort. The NBC system provides dry, temperature-controlled filter air to the crew. The NAMICA has a retractable armored launcher that can carry 12 Prospina (Nag) ATGMs, with 8 of them in ready-to-fire mode at a distance of 4km. The NAMICA carrier was put through transportation trials covering 155 km during 2008 summer trials. The Army reportedly has a current requirement for around 68,000 ATGMs of various types and over 850 launchers over the next 20 years. DRDO is also developing the helicopter-launched version of the NAG, known as HELINA. The helicopter-launched configuration, designated as helicopter-launched NAG (HELINA), using the "Rudrastra" canister-encased twin-launcher system, will arm both the HAL "Rudra" (ALH WSI) helicopter-gunships as well as the HAL Light Combat Helicopters (LCHs) of both the Indian Army and the Indian Air Force.